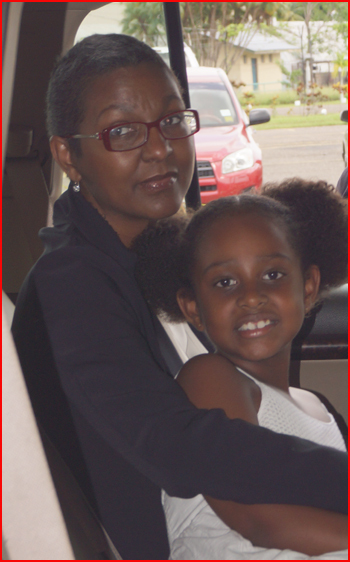 The Office of the Prime Minister has released this picture of the First Lady and her daughter upon arrival in Belize. Kim Simplis Barrow has arrived home after weeks of cancer treatments in Miami, Florida. In what had been a difficult chapter, Mrs. Barrow experienced complications as a result of her treatment for breast cancer. Fluid had developed in her lungs and an irregular heartbeat prompted doctors to take her into intensive care. Tests revealed that her heart was severely damaged. At one point, only 10 to 15% of her heart was functional. According to doctors, most of the damages are irreversible. Prime Minister Barrow said that Doctor Bernard Bulwer in Boston and Doctor Dorita Arzu in Houston had arranged for her to see a doctor that specializes in treating heart failure arising from radiation and chemotherapy damage. While in Belize, Mrs. Barrow will be treated by Dr. Adrian Coye. Dr. Coye spoke to Mrs. Barrow’s doctor from Miami on Wednesday morning in regards to her present condition. Mrs. Barrow expressed her profound appreciation for all the good wishes and expressions of concern from Belizeans at home and abroad and is extremely happy to be once again at home among family and friends.